"Gee, pill, you certainly have a lot of patience and courage"
a bug until they decide to make me a patch"
"Listen to those players arguing! Is all the anger and malice about you?" decide I'm worth fixing, otherwise I may become a feature." a problem! NOW I go to the senior engineering team and they consider fixing me"
"If they fix you, what happens?" "Then I go over to quality control and the whole thing starts all over again"
"You mean even if all the players scream you need to be fixed, the coder can still say no?" and if he decides it's not worth it?" "By that time, it's very unlikely you'll become a patch. It's not easy to become a patch is it?" But I hope and pray that I will. But today, I'm a bitter pill. "He rewrote you! Bug, you're a patch!" #DDO downtime got you down? Check out the Oracle's new Wayback Machine! Revisit the guilds of 2013 and travel time! To 'celebrate' the anniversary of the loss of DDO character data a year ago, the Oracle has brought forth ? the Wayback Machine! The Wayback Machine contains the guilds and guild rosters of all the worlds of DDO, as they were last scryed in May of 2013. Beyond this, they also include the previous guild members and members who were no longer active. The Oracle is serious about watching you. Find out who used to be in your guild. Find your character build from 2013. Reminisce about guildies long gone, or be surprised to see who used to be in your guild. For DDO is community both across the Earth, and across time. The Oracle releases new Oracle Trax - realtime DDO server activity for your website! And now for something completely different - the Oracle is now serving up DDOracle Trax, a graphic designed for DDO fansites that shows the current server loads for the last 4 hours, updated every hour. Currently the ticker is updated on the hour. It fits well in the current size, but if you'd like a different size please ask. As this is an entirely new kind of feature, this may evolve considerably as we get feedback. In the meantime, enjoy! The Oracle is starting to wonder if the #LotRO crowd realizes what the new LorRO Traffic report is? It's been a week since the Oracle has added the new Traffic Report for Lord of the Rings Online., but outside of a considerate retweet the LotRO crowd has been pretty quiet. Given how popular and how closely watched the DDO Traffic Report has been, this is somewhat surprising? Who knows. Since LotRO traffic is now a standard report, the previous special report Perspectives has been removed. Now either side can see how the other half lives at any time, just need to figure out where it goes on the menu! Interest in DDO traffic is at an all time high and your Oracle has tried to keep things very fresh. 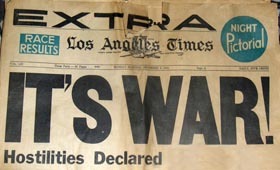 Still, there is a sense that people want more and thus it was time for another special report. Your Oracle brings you Perspectives, a first hand look into a day (today) in life in Lord of the Rings Online. No, that's not a graphic error. There are more servers than will fit on the legend, more servers than the Oracle could find colors for, and yes, that's the traffic for a single day. Lord of the Rings Online? You watch Lord of the Rings Online?!? The glass half-full and glass half-empty factions may begin their earnest debate now. Today's Traffic Report shows Wayfinder is still making gains, but _what_ is up with Ghallanda the last 2 weeks?!? Seeing the big spike in interest in the Traffic Report recently, the Oracle scryed and found active discussions on several forums concerning the impact of the new Wayfinder changes, the upcoming expansion, and general activity. So to bring light to the darkness, your Oracle has prepared a special report, MotU One Year Later, a large, hand-annotated graph. This is not a production item, and the lower axis is a bit hard to read with 365 data points, but it should provide food for thought, and be better than people trying to sew things together from past updates and memories of earlier figures. Click on the upper right to zoom in. The Oracle thinks the impact of Update 14 has been underrated, but see for yourself. Long has the Oracle watched #DDO's lonely world of Wayfinder, and pitied it's people. Kudos to Turbine for taking steps to help. Heh, #DDO login screen says "UP", but they sure don't feel up. Good time to catch up on those most popular multiclass build options. Good news and bad news. The Oracle continues to keep his watchful eye on all of #DDO, but guild renown data is no longer available. The Oracle has had to watch the puffing, primping and posturing for too long. Let the truth be known! For the first time, guilds across ALL worlds have been measured. You will see the truth of their worlds, the truth of their efforts, and the strength of their will, or lack thereof. Most will be found wanting. But rejoice! For now the Eberron's truly greatest heroes will be clearly known. The Active Update is now live! Several billion bytes later, the Oracle adds a new way to look at the world, and made it the default. With today's update, the Oracle now identifies active characters versus inactive. An active character is one that's logged in in the last 6 months. Half a year. Sadly, the Oracle has found that only about 2/5ths of DDO's characters are actually being played. Tracking who was actually being played was a ton of work. Switching from tracking all characters to specifically active ones has created some major changes in the rankings! Monks, Warforged, Drow, Elven Rangers - these and more jumped up significantly in rankings of active characters. This is especially interesting in how it highlights changes over time in what characters people actually play. There are many interesting changes, so many that instead of trying to cover them all, the Oracle now supports two different reports. By default you will now see Active statistics/rankings, but click up top and you can switch to All stats/rankings as you see fit. Colors have been changed to make it easier to know which you're looking at. There's more to come. Click on your world and learn the truth. Enjoy. Diving through the vaguries of the data and figuring out what exactly respresents what is a serious chore. Time for a long overdue Thanks!(?) to many folks on Thelanis, and in particular the extended Starfleet family, for their help over the [seriously?] years. A number of guild leaders have spent literally an hour or more, detailing their guild history and helping the Oracle track down how it's actually encoded. Take note, guildies. They do actually work for a living! To tweet or not to tweet... that is the question. The great thing about Twitter is the 140-character limit. Unfortunately, the worst thing about Twitter is the 140-character limit. It's perfect for quick updates, but pretty limiting otherwise. Thus the Oracle's new blog, which blends tweets & posts to get the best of both worlds. Pretty much tore things down to the studs, but it was a structural necessity that allows for more content. There's something on the wind. Something's coming. We must be ready. Unfortunately the plague hit just as the Oracle was making renovations, and delayed everything up until Cove hit. Interesting how clearly today's quarterly update shows the small drop in #DDO players during the holidays. Looks like a smile. The All-knowing Oracle exists on all the worlds of #DDO. Will take some time to be available on Kyber tonight and see how it goes. The DDOracle is updated. 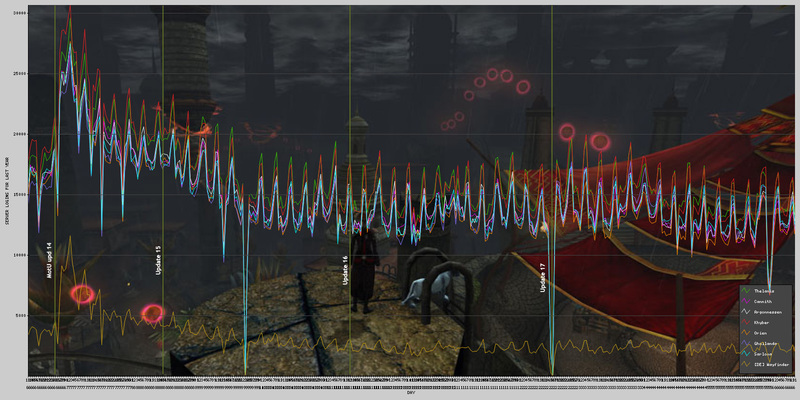 The latest #DDO reports, plus new click-to-zoom detail graphs and a new quarterly load history. Enjoy! Behold and spread the word! All the worlds of #DDO are now under the Oracle's watchful eye. Where there was conjecture, let there be truth! RT @DDOUnlimited: The DDO Forums (and http://t.co/xRjyilRh ) are once again available. Thanks! #DDO < Fixed us too, thanks guys! 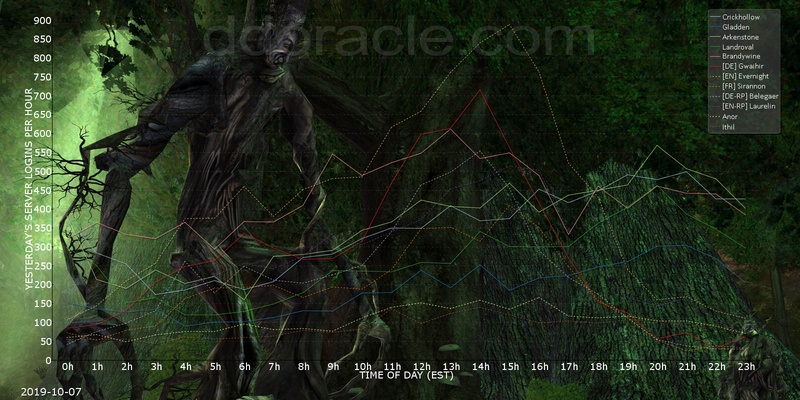 Celebrating #DDO's New Year with a late gift from the Oracle - new Monthly traffic as well. Be good this year, the Oracle's watching! Heh, love that 20+% load spike on New Years day. Holiday's are over, back to #DDO! Am I the only one who finds it odd that there's no #DDO ice festival on the shortest day of the year? Word has it there's an interest in historical #DDO load values. I'll see what I can do.